Hey, want a crash course in writing and illustrating for the children's market? 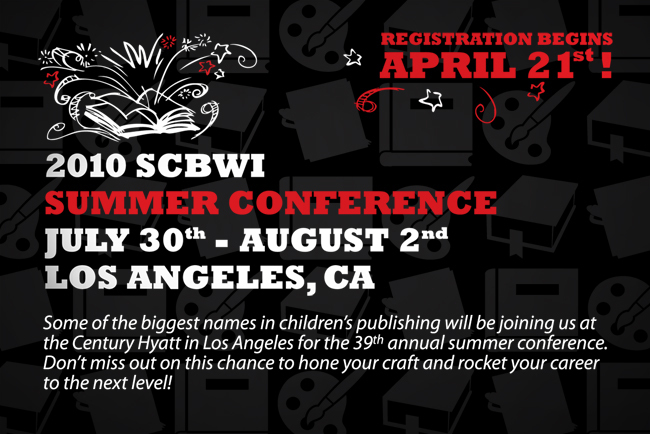 Then make your plans now to attend the SCBWI summer conference. I'll be there! Illustrators - you can hear from E.B. Lewis, Ashley Bryan and Loren Long. Take workshops with Priscilla Burris and David Dias and get tips for portfolios and promotion with Pat Cummings and art director Cecilia Yung. Or you can take one of the advanced tracks. There are two for illustrators this year, one on graphic novels and one on digital illustration. Not to mention all the authors, editors, agents and art directors who will be there. 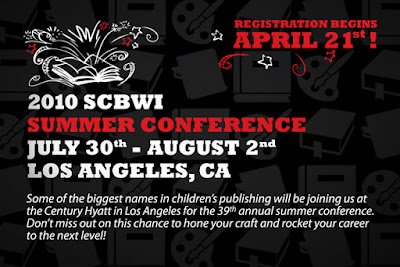 Registration opens today, check it out at the SCBWI website. I looked over the schedule yesterday. Looks like it will be another fabulous conference. *sigh* Fingers crossed that next year will be just as awesome, because I am SO planning on going!